Used Ford C-Max Review - 2007-2011 | What Car? What's the used Ford C-Max MPV like? 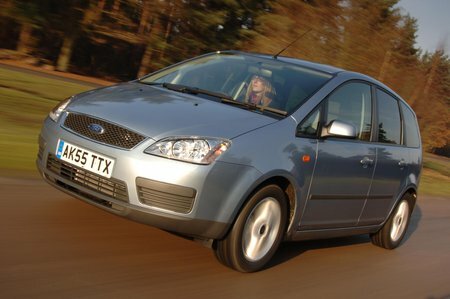 The Ford C-Max is more revamp than a complete reinterpretation - this model builds on the success of the original Focus C-Max ('03-'07), to become a great five-seat MPV. Think of it as a Focus that's put on some pounds. It's almost as good to drive as the hatchback, with refined handling, plenty of grip and sharp steering. The ride is comfortable, with limited body roll on faster corners, yet it's able to absorb bumps and scars on uneven roads. Wind and road noise are also well contained. Passenger space is generous in the front, and there's room for three in the back, although the middle seat is more restricted. The rear seats can also be removed to swell the decent boot to accommodate bulkier items. All-round visibility is good, and there's an additional rear-facing mirror so you can keep an eye on the kids in the back. The cabin has a well laid-out and durable feel, with quality materials and sturdy construction.